The System-On-Chip (SoC) department, brings together one of the largest group of researchers in France working on different aspects of embedded autonomous smart systems, thus closing the gap between Electrical Engineering and Computer Science. 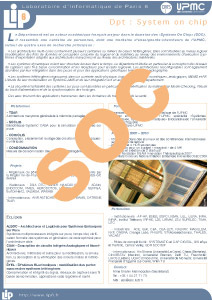 The activities of the SoC department include: design of parallel architectures, optimization of parallel applications, software robustness verification and code hardening, modeling, design, and test of heterogeneous systems used in wireless communication systems, and autonomous sensor networks (including digital, FPGA, analog, RF, sensors, actuators, and MEMS). The targeted applications are Radio Frequency communication, e-health, transportation. Those themes are handled by 4 complementary teams: ALSOC studying multiprocessors system on chip and their software stack,CIAN focusing on Electronic Design Automation (EDA) for heterogeneous systems, starting at transistor level, and SYEL studying performance of heterogeneous systems, and designing e-health applications. In September 2016, the QI team has joined the SoC department. Its research covers the development and implementation of various quantum cryptographic primitives such as quantum key, distribution, quantum coin flipping, quantum secret sharing, and blind quantum computing. The team also investigates foundations of quantum physics, quantum entanglement, nonlocality and their potential applications in information processing tasks as well as verification of quantum devices and quantum parallelism that have overlaps with existing activities at SOC. Analog and digital hardware and software co-desing, multiprocessors, embedded operating system, test, verification and compilation, FPGA, virtual prototyping, quantum information, cryptography and security.